AOMEI Partition Assistant Standard Edition 7.0 is a free partition manager with basic tools and advanced functions. It is an easy to use tool which helps you to manage and set up partitions on your hardware drivers. It could help you to resize, move, merge, copy, format, split, format and delete partitions and so on. AOMEI Partition Assistant is completely compatible with Windows 2000/XP/Vista/Windows 7/ 8/8.1, and the latest Windows 10 (32bit and 64bit). Support all storage devices such as: flash drive, HDD, SSD, RAID array in both MBR and GPT disk styles. What had to change for the latest version 7.0 here? Resize and move partition to reorganize your hard drives. Migrate OS to SSD or HDD for system migration to solid state drive or hard disk drive. New! Extend NTFS system partition without restarting your computer. Merge two partitions or merge non-contiguous unallocated space to partition. Allocate free space from one partition to another to fully utilize disk space. Copy disk to a new one without reinstalling Windows and applications. Partition Recovery Wizard helps you recover lost or deleted partitions with ease. New! Even if there is no unallocated space, you can create more partitions. Convert the main to logical partitions, and vice versa. Linux partition management: create, delete, format, wipe, copy, recover Ext2/Ext3 partition, etc. New! Make bootable CD for safe and better disk partition management. New! Support 2TB MBR disk, 4TB GPT disk, and USB flash drive. Support Windows 2000 Professional, Vista, XP, Windows 7 SP1 and Windows 8 (all editions, 32 bit and 64 bit). Simple to Use, Quick partition. AOMEI Partition Assistant Free For GDPR Compliance is especially designed to comply with EU General Data Protection Regulation (GDPR). It is the unique, absolutely clear yet free partition manager which doesn’t contain any information tracking and/or collecting program. AOMEI Promises to Deliver GDPR Compliant Products and Services, our business is built on security, respect and accountability. 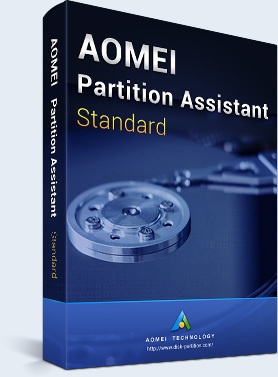 AOMEI Partition Assistant is useful ranging from the basic functions to time-saving. The newly upgraded version are including rich partition features and hard drive management as well. If you want to manage hard disks and partitions in Server windows, you can upgrade software to Server Edition. If you want to maintain multiple computers in one company, you can use AOMEI Partition Assistant Unlimited Edition. If you want to offer a profitable technical service to someone or a company, AOMEI Partition Assistant Technician is a good choice! AOMEI Partition Assistant contains all the basic partition features and advanced partition functions, try it now?